I include the catchall: "Please know that I am always trying to learn more, and may have sites to add as the year progresses"
Trying to incorporate more technology into the classroom comes with a few hurdles. The dreaded username. Students forget them, confuse them and even steal them (Yes – I have had students hack into each other’s Vocabulary.com site to try and sabotage their points!). Parent Concern. Some parents are concerned with their students creating accounts and want to be more hands-on. So how to I jump over these hurdles? The solution is actually pretty simple. Last year I created a Technology Letter. It is a three-page document that I went over in class with my students and sent home with them on the first day of school. The introduction explains to the students and parents WHY we will be using technology and how it will benefit our education. 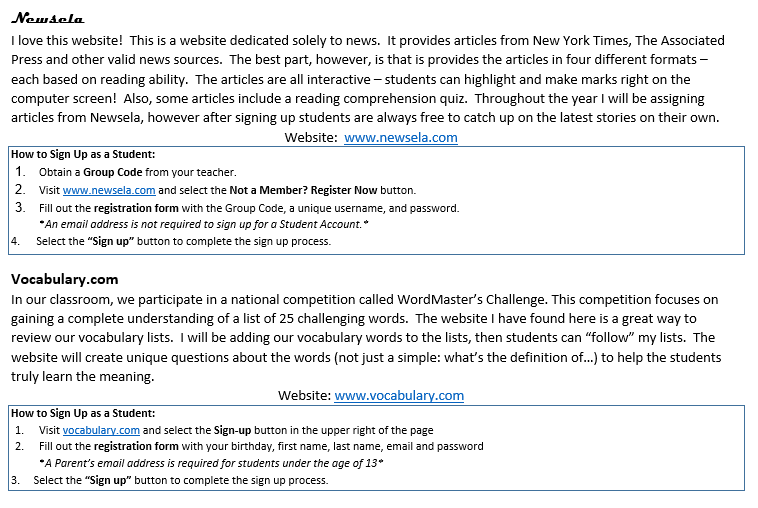 Next, I outlined each website I plan on using, including specific sign-up instructions and the website’s purpose. On the last sheet, I made two copies of a Username and Password cheat sheet. The purpose is that one will stay at home and one will stay on file with me. This turned out to be worth its weight in gold for how many times students came up to me during the year because they forgot their password or username. 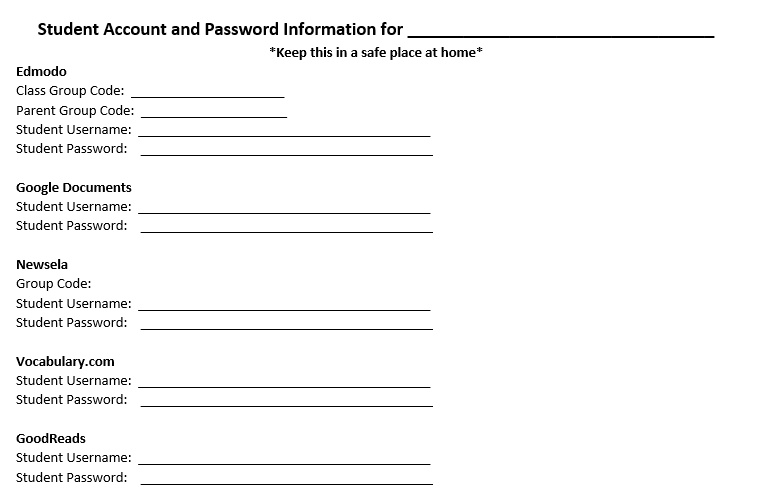 The students had one week to sign up for all of their accounts and return the username/password portion to me with a parent signature. Try this quick and simple idea in your own class!